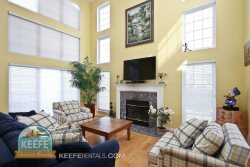 Keefe Vacation Rentals - Geneva National Golf Resort 3 Bedroom Villa. Golf Course Villa in Beautiful Geneva National! Let your dreams of living on a beautiful golf course come to reality in this stunning (3) bedroom (3.5) bathroom, Woodland Condo in Geneva National! The premiere golf resort community in southeastern Wisconsin, Geneva National offers guests the unique opportunity to enjoy upscale vacation accommodations, in a private and tranquil resort community. Enjoy three finished levels with hardwood flooring, a private kitchen, and expansive family room all on the main floor. Bedrooms on the second floor and in the finished basement offer comfortable accommodations for all guests. Interior amenities include King & Queen beds, WiFi internet access, cable television and direct access to the outdoor deck overlooking the 17th hole of the Trevino Golf Course. Outside, guests may enjoy a gas grill, the outdoor deck, and a lower-level walk-out patio (furnished). Activities within the resort community include scenic drives, a wooded nature hike, golf, outdoor pools (the daily pool fee is $12 for adults and $8 for under 12 years old), and more! Enjoy dining options at the Hunt Club Steakhouse and concierge services - all in all this is the place to be to enjoy the best the area has to offer for off-shore luxury. Geneva National Golf Club: Located just 4 miles west of Lake Geneva, Wisconsin, this 1600-acre community surrounds the 54 holes of Legendary Golf, and also offers tennis, swimming, water sports, and miles of scenic hiking trails and much more. Enjoy the fitness center and a full range of guest amenities. I delt with Alisa Bliss for this rental. She was excellent. Response time to any questions I had was quick & efficient.